Bull Str. Production Studio was founded in 2016 by Panos Topalidis in collaboration with Nick Vettas. It’s a recording studio based in Edessa, GR and is located in Dionisiou Boulgouri Street. 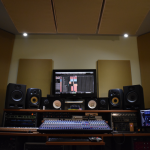 The studio provides a great amount of gear for most of musicians, a very comfortable live room for rehearsals or studying and excellent recording quality and production for your album.